Disillusioned actress Sunny returns to her hometown of Bent Arrow, Texas, to attend her mother’s funeral and provide guardianship for a half sister she never knew, 10-year old Cotton. The dusty old town is struggling to stay alive, but maintains its quaint and quirky charm. It provides solace for an ex-NFL player, Butch, who is coping with a heart-wrenching loss by painting watercolor postcards at a roadside stand. Sunny and Butch bond over their mutual relationship with Cotton, and come up with a plan to help save the town. When tragedy strikes, their plans are derailed, but hope glimmers in the distance. 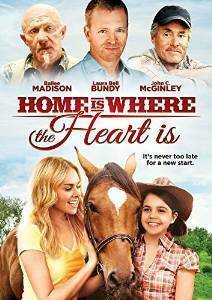 My Thoughts: Home is Where the Heart Is is the perfect feel-good family movie. Is has the perfect blend of heartache, romance and drama to keep everyone entertained. Rio 2 is a fun family movie to watch. The best family movie i have seen lately is Tad the Lost Explorer. We recently saw Planes Fire and Rescue it was a good family movie. Lately, we haven't seen any real good family movies. My entire family enjoys Flushed Away. It is not new but as love it. The best family movie i have seen lately is Frozen. That would be Frozen. Our town showed it at our local park one night. The last movie we watched as a family was Peppa Pig -- it was the kids turn to pick a movie. The best family movie I have seen lately was Rio 2. We saw Guardians of the Galaxy. The best family movie that we have seen lately is Antboy. I think the best family movie that we have recently seen is a oldie but a goodie Home Alone. Loved it as a kid and still love it as adult. The best family movie that we have seen is Frozen. We all loved it. The best family movie ive seen recently is an oldie but goodie i rediscovered the Little Rascals. My children absolutely love this movie.